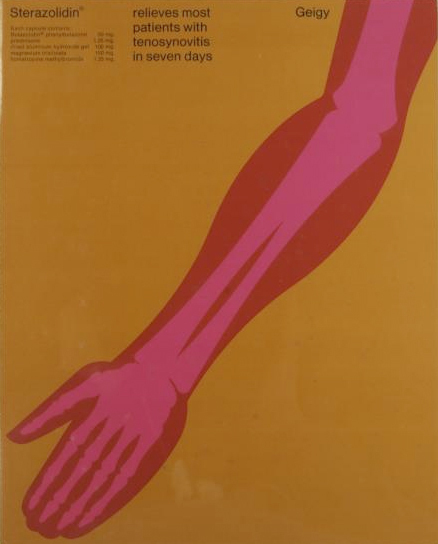 Fred Troller 1930 – 2002 was a distinguished American graphic designer and educator who emigrated from Switzerland. He was born in Zurich in 1930 and graduated from the Zurich School of Design in 1950. He worked for Geigy Chemical Corporation and later established his own design studio in New York working for clients such as Exxon, General Electric, IBM and American Airlines among others. He also designed book jackets for Doubleday. As Steven Heller writes, "Troller helped popularized Swiss New Typography... the Swiss approach, influenced by the Bauhaus school of the 20's, relied on stark photographic imagery, bold sans-serif typefaces and primary colors in unfettered compositions. The object was to communicate logically, vividly and without ambiguity... Mr. Troller's personal variant of the style was characterized by the manipulation of geometric forms, jarring juxtapositions of large and small types and visual puns formed from the fonts themselves." Fred Troller was also a design educator and taught or lectured at Cooper Union, the School of the Visual Arts, and Rhode Island School of Design. He also served as chair of the division of design at Alfred University. The Troller Archive was donated by Beatrice Troller in 2005 and includes a vast amount of material ranging from sketches, mock-ups and proofs along with final printed projects including book jackets, promotional materials, packaging and posters. Heller, Steven."